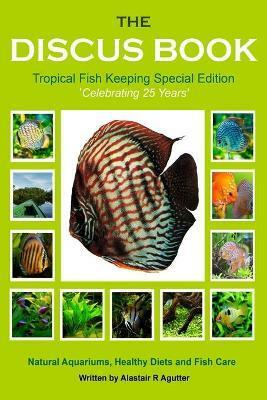 The Discus Book Tropical Fish Keeping Special Edition - Celebrating 25 Years! For Natural Aquariums, Healthy Diets, Fish Care and more..... "The Discus Book" first published in 1989, now celebrating 25 years in 2014 with this full colour special edition. With over 110 full colour pictures and just 17 black and white images of early days spanning 25 years as a special edition book. Description of the Book: This Book is for all Tropical Fish Hobbyists and enthusiasts. Where you will find inside the book proven methods for the successful keeping of any tropical fish, always healthy and disease free...... This "Special Edition" is for all Tropical Fish Keeping enthusiasts of all ages. With a blaze of fabulous colour plates and pictures, including images and photographs from the breeders first book 25 years ago and now these archive images serving as a time capsule in book form, for every Aquarist to study, reminisce and enjoy! Where many of the old methods are still always the best! Covering Fish Care for Discus, Cichlids and other Tropical Fish species. Natural Aquariums, Successful Breeding of Cichlids, Community Fish Aquariums, Filtration, Lighting, Suitable Plants, Special Recipes in the book for Preparing High Protein Fish Food to ensure your tropical fish are always healthy and thriving......... "Author: Alastair R Agutter, began keeping and breeding tropical fish cichlids as a hobbyist from the age of 9 years, now with over 46 years experience." CONTENTS OF THE BOOK: CELEBRATING 25 YEARS The Discus Book celebrating 25 years on since the 1st Edition was written, the advancements and specie strains since those early pioneers of breeding. INTRODUCTION Introduction to the Book and the concerns expressed even 25 years later after writing this book in hard copy. CHAPTER ONE The Discus and its Natural Environment. CHAPTER TWO The Wild Discus Species from South America. CHAPTER THREE The Importance of the Correct Aquarium. CHAPTER FOUR Live and Prepared Foods for the Discus Diet. CHAPTER FIVE The Requirements for Discus Fish Filtration. CHAPTER SIX The Genetics and Different Strains of Discus Fish. CHAPTER SEVEN The Lighting and Electrical Needs. CHAPTER EIGHT Collecting and Purchasing the Correct Fish. CHAPTER NINE The Correct Water and Techniques. CHAPTER TEN The Spawning of Symphysodon (the hard work begins). CHAPTER ELEVEN A Natural Discus Fish Aquarium with suggested Plant Species and Equipment, for a stunning aquarium. CHAPTER TWELVE The type of other Fish species you can enjoy and have with Discus Fish in a Community Aquarium. CHAPTER THIRTEEN Fish Care and the important points for having healthy Discus Fish and other Tropical fish species by forming a bond and routine. CHAPTER FOURTEEN Identifying Symptoms of the Discus Fish diseased and other Tropical Fish species, the remedies and the steps you can take to try and cure. CHAPTER FIFTHTEEN Concluding points and other related resources and places of interest on the World Wide Web for following your passion and interest. Alastair Agutter is one of a select few world-wide to successfully breed the Discus (symphysodon) species King of the Aquarium in captivity and an authority on these tropical fish species and others, as an accomplished Best Selling Author of Specialist Books Internationally. His enthusiasm as a dedicated Aquarist continues today with a number of projects underway; including the development of new biological filtration systems (Polyatomic-ion Biological Reactors), to help improve the success survival rate for keeping thriving plants with tropical fish species. Other projects include breeding a number of endangered species including original strains of the symphysodon family and other smaller indigenous species native to South America mainly inhabiting the Great River Amazon.